Brazil’s President Dilma Rousseff has proposed a referendum on political reforms in an effort to tackle protests that have swept the country. Dilma Rouseff also promised to boost spending on public transport and focus on health and education as part of what she called “five pacts” with the people. She later met regional mayors and governors, who agreed to her plans. But some activists promised to carry on with the largest protests Brazil has seen for at least two decades. Mayara Longo Vivian, a leader of the Free Fare Movement, said there had been “concrete measures” among the president’s proposals and that the “fight would continue”. On Monday evening, there were fresh demonstrations in several cities, although they appeared to be smaller than those that led to clashes with police last week. A week ago 100,000 people marched down the city’s Rio Branco Avenue, but on Monday just a few dozen were chanting in front of the Candelaria church. More people joined in as they marched, and soon a few thousand demonstrators had popped up and were occupying the city centre’s main avenue. Street vendors were selling Brazilian flags and Anonymous masks for those who came unprepared. In other protests, hundreds of people blocked the main road to Brazil’s busiest port, Santos, and hundreds more came out to protest against corruption in the capital, Brasilia. Two women were killed at a protest in the central state of Goias, not far from Brasilia. Police said they were killed by a driver who sped through a roadblock they had set up with other protesters. The deaths bring to four the total number of lives lost in the unrest. The president met leaders of one protest faction before meeting with state governors and mayors. “My government is listening to democratic voices,” Dilma Rouseff told a televised news conference. “We must learn to hear the voices of the street. We all must, without exception, understand these signals with humility and accuracy. She also suggested tougher penalties for corruption, and warned against any repeat of the violence that was seen last Thursday. 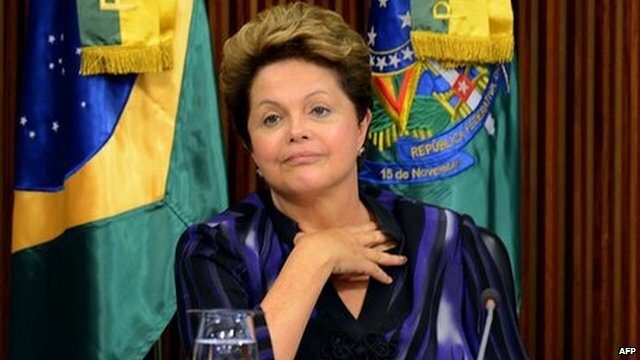 Dilma Rousseff faces re-election next year, when Brazil is also due to host the football World Cup. Rio de Janeiro will also host the Olympics in 2016. Many of those demonstrating are unhappy at the cost of building stadiums in a country where many live in poverty and ticket prices for such prestigious international competitions are out of reach. Unrest has dogged many of the fixtures currently taking place in Brazil as part of FIFA’s Confederations Cup, seen as a dress rehearsal for the World Cup and using many of the same facilities. FIFA’s Secretary General Jerome Valcke has said the organization has “no plan B” for next year’s World Cup. The wave of rallies in more than 100 cities began in Sao Paulo, where residents were unhappy at planned rises in public-transport fares. Those increases have since been shelved, but the protests rapidly became more widespread and the protesters’ demands more wide-ranging. Brazilians have been demanding better health and education, saying they are fed up with paying relatively high taxes and feel that they do not get enough back from the state. Protesters are also angry about corruption and are scornful of politicians.